Reuters reports an attorney for Asarco said tonight the company received several bids for the bankrupt company but would not say who made them or how big they are. A decision on the offers will be made by the end of May, he said. Asarco produces a reported 350-400 million pounds of copper annually domestically. 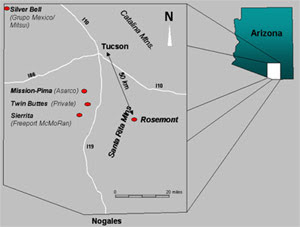 It's 3 big open pit mines in Arizona are Mission, Ray, and Silverbell. Augusta Resources has sold 45% of expected silver production from the Rosemont Copper project to a company for an upfront cash payment of $165 million. Silver Wheaton Corp. had previously announced last December to a binding agreement to purchase 45-90% of the life-of-mine silver that the Rosemont mine will produce. [right: Rosemont copper mine area, from Augusta Resources]. Augusta says the money will be used to fund construction of the mine. According to Augusta Resources the proposed Rosemont mine is expected to produce annually 220 million pounds of Cu, 4.5 million pounds of Mo, 2.7 million ounces of Ag, and approximately 15,000 ounces of gold as a by-product over the 18.2 year mine life. Current proven and probable reserves at Rosemont contain 61.6 million ounces of silver, measured and indicated resources contain a further 4.9 million ounces and inferred resources contain 9.3 million ounces." Prominent UA climate scientist denies climate change - NOT! 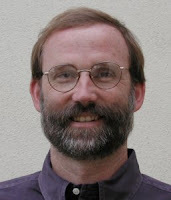 The Heartland Institute is distributing an article titled "500 Scientists with Documented Doubts of Man-Made Global Warming Scares" that lists a number of University of Arizona scientists as doubters of human impacts on climate change, including Jonathan Overpeck. The problem is that Peck [right] as he is called, is one of the principal authors of the IPCC climate change study that won the Nobel Peace Prize and is a leading expert on human-induced global warming. Dozens of others on the list are demanding their names be removed or are threatening legal action, according to DeSmogBlog.com. 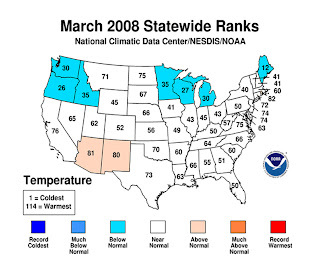 Heartland Institute recently held the 2008 International Conference on Climate Change in New York, which was widely viewed as a major gathering of climate change skeptics. Two Arizona-based solar companies, Global Solar Energy in Tucson, and First Solar in Tempe, are profiled in a story in Scientific American on the growing power of thin-film technology for solar photovoltaics. Even though this growing technology requires much lower amounts of minerals, the ones they use are rarer and harder to come by. 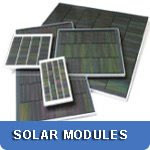 The success of the mining industry is crucial to feeding demands of the solar power industry. Gov. Napolitano yesterday signed into law Senate Bill 1438, introduced by Sen. Jake Flake, R-Snowflake, to allow State Mine Inspector Joe Hart to accept donations of inert materials, equipment or services to fill abandoned mines, as long as the donated materials are not flammable, will not decompose and will not leach substances into groundwater. A proposal to fill the mines with used tires ran into environmental concerns. The world uses somewhat more than one cubic mile of oil (1 CMO) per year according to a study by Ripudaman Malhotra, at SRI International, as reported in “Can renewable energy make a dent in fossil fuels?” by Michael Kanellos found on News.com. Total energy consumption per year from all sources is about 3 CMOs. To equal 1 CMO, we have to cover 4.2 billion rooftops with solar panels. Or build 2,500 new 900-megawatt nuclear power plants (one per week for 50 years). Or erect 3 million wind turbines (1,200 per week for 50 years). And during those 50 years, the demand for power will continue to grow, especially in developing areas of the world. What this means is that we are going to be dependent on fossil fuels - oil, gas, coal - for a long time. 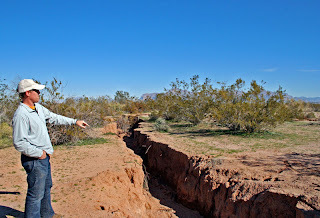 The East Valley Tribune published an extensive set of news features on earth fissures in their Sunday edition, including timeline, maps, videos, and an animation of how fissures form. KPHO, CBS channel 5 in Phoenix, also has a nice video segment with great aerial shots of the 2005 fissure in Chandler Heights that triggered the recent interest in this hazard. The National Audubon magazine has a nice one-page explanation of the Cap and Trade process for carbon dioxide that is being considered in Congress. It was recommended by the Interstate Oil and Gas Compact Commission. Resolution Copper - Today's Arizona Republic carries a prominent story about the Resolution copper mine's positive impact on the economy of Superior. The comments from readers, posted online, include a disturbing theme of xenophobia that seems to be growing. A number of diatribes are posted blasting "foreign" or "British" owned companies for investing in Arizona in hopes of making a profit. And a few weeks ago, David Salsbury took over as President and CEO of the company, replacing John Rickus. Rosemont copper mine EIA politicized - Congress-people Raul Grijalva and Gabrielle Giffords are calling for an investigation into the U.S. Forest Services awarding of a contract to SWCA Environmental Consultants to do the Environmental Impact Analysis for the proposed Rosemont copper mine in the Santa Rita mountains. Typically, the feds offer to let the mining company (or other developer) pay for the cost of the EIA if they want to get it done within their lifetimes. Otherwise the federal agency waits until funds can be found in their budgets. But, the USFS rather than the developer, picks the group to do the analysis. Our representatives apparently believe SWCA will not be objective in their study. Freeport profits up, market hates it - analysts and bloggers at Motley Fool financial site describe the stock market as "exhibiting frequent signs of irrationality and dementia these days" for ignoring copper, moly, and gold-producing Freeport-McMoRan's quarterly earnings of $1.12 billion, or $2.64 a share, more than double the $476 million in the same quarter a year ago. They attribute the increase to the merger with Phelps-Dodge and the high price of copper. Asarco - bids are due Wednesday to the bankruptcy judge for the sale of Tucson-based Asarco LLC, which is the 20th largest employer in southern Arizona with 2,185 and owns the Mission mine near Green Valley, the Silver Bell mine near Marana, the Ray mine near Kearny and the smelter at Hayden. Asarco's Peruvian mines are estimated to worth $7-8 billion. The Earth Science Literacy Initiative is holding a 12-day online conference starting May 12 to establish the “Big Ideas” and supporting concepts that all Americans should know about Earth sciences. Joaquin Ruiz, a geoscientist and dean at the University of Arizona, is a member of the organizing committee. "Critical decisions involving Earth science are continuously made within the political and educational realms, with significant impacts on all American citizens." "The research community must do a better job of helping the public understand the most important concepts emerging from geoscience research. However, understanding scientific discoveries requires a science-literate population." "Unfortunately, we also live at a time when there are strong movements that seek to discredit the discoveries of scientific research. Whether acting out of fear, misunderstanding or malice, these movements often portray the healthy debate of scientific inquiry as confusion and a lack of agreement. An individual or set of individuals pushing certain self-serving agendas can almost always find a quote or viewpoint that backs their idea. Many of the foundations of our sciences, such as the age of the Earth, radioactive decay, biological and planetary evolution, climate change, and even the existence of plate tectonics, are discredited and ridiculed by extracting fragmented quotes from prominent scientists and taking them out of context. A deep schism is opening up within our country: at the same time that tremendous scientific advances are being made, increasing percentages of Americans are refusing to believe them." 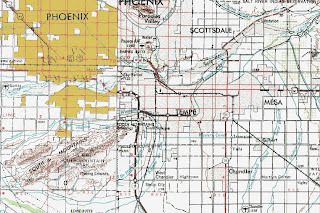 The USGS has updated the National Seismic Hazard Maps but questions remain as to whether they accurately reflect the seismic hazards for Arizona. The assessments consider recurrence intervals on faults but rely on results from seismic networks across the country. Since we have not had sizable quakes in Arizona since seismometers were invented and deployed, are we confident that the recurrence intervals are realistic? 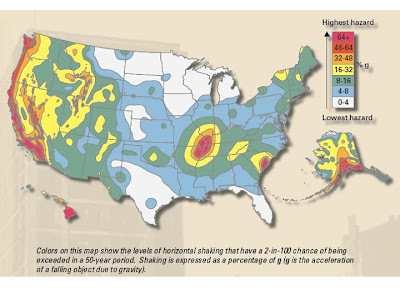 A number of efforts are underway to get a better handle on seismic hazards in Arizona. AZGS is working with seismologists at UA, ASU, and NAU to permanently keep some of the seismometers temporarily deployed in Arizona for the EarthScope USArray. We also will be meeting with the USGS to discuss setting up a cooperative working group similar to those in Utah and Nevada that have been very successful. AZGS is also partnering with the Utah Geological Survey to seek federal NEHRP funds to conduct paleo-seismology studies in NW Arizona. 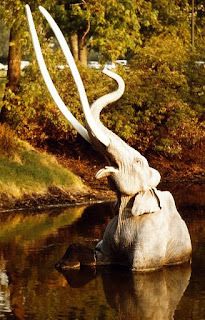 Did global cooling kill the mammoths? 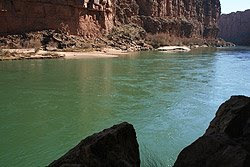 A new study by Vance Haynes Jr., a Regents’ Professor of anthropology and geosciences at The University of Arizona, ("Younger Dryas 'black mats' and the Rancholabrean termination in North America") is published in the April 21 issue of the Proceedings of the National Academy of Sciences’ Online Early Edition. Haynes looks at the impact of the 1,100 year Younger Dryas cool period that began then and what role it played in the change in fauna. Others have proposed that humans hunted many species to extinction or that an asteroid impact wiped them out. Meteorites are samples of the larger planetary economic commodities and resources that humans will need as we explore and colonize the solar system, according to a presentation at last week's AAPG annual meeting in San Antonio, by a team from the UA Southwest Meteorite Center in Tucson. They argue that meteorites are natural resources that can provide food, water, fuel, shelter, radiation shielding, construction materials, etc. Okay, this is not Arizona geology, but these photos are just too amazing to let go by. Phil Plait who blogs at Bad Astronomy (one of the best science blogs by far and from whom I stole the title of this posting) describes clearly and simply what's going on in many of the photos here. 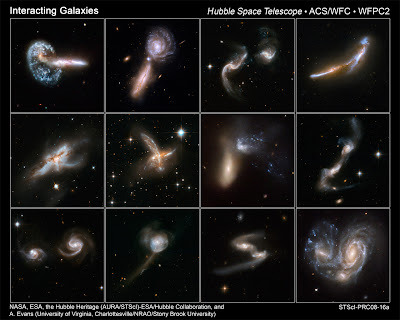 The whole set of 59 colliding galaxies can be found at the Hubble site. The photos were released in celebration of the Hubble telescope launch 18 years ago yesterday. I had the incredible fortune to not only be at the launch in 1990, but to be sitting in the VIP section, closest to the launch pad, at the invitation of geologist-astronaut Kathy Sullivan, who was on the space shuttle crew. The line from the song in West Side Story - "everything's free in America!" - is fast becoming reality. The Digital Map Store is offering free printable topo maps from USGS, Forest Service, and Natural Resource Canada. Meanwhile, the USGS announced earlier this week that over the next 9 months, they will be opening up the Landsat archive for no-charge ordering. Rich Thompson, a lecturer in the Geosciences Dept at UA killed a rabid bobcat with his rock hammer last Saturday, after it attacked him and his wife while hiking in the Santa Rita Mountains south of Tucson. The story hit the local papers yesterday and today it's all over the world. Katrina Mangin, who is a marine biologist at UA had to fight the bobcat off when it leapt onto her leg and back. 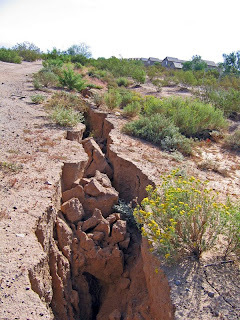 The Phoenix chapter of the Association of Environmental and Engineering Geologists (AEG) has set up a web listing of companies who work on subsidence and earth fissure projects in Arizona. Section president Ken Fergason set up the list at my request so we can refer people who are looking for experts to help them. 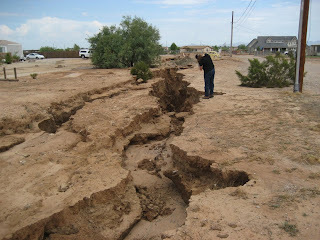 We urge anyone hiring a consulting engineer or geologist to verify that they are licensed to practice in Arizona (through the AZ Board of Technical Registration) and to inquire about their expertise in subsidence, earth fissures, or similar hazards like problem soils. The session was organized by the Association for Women Geoscientists (AWG) and AAPG Professional Women in Earth Sciences (PROWESS), with support from AWG and Chevron. My thesis was that there are lots of reasons for promoting a diverse workforce (it’s the law, it’s the right thing to do, etc) but I argued that any organization that doesn’t aggressively embrace diversity is going to die in the 21st century marketplace. First, as PRI president Shirley Ann Jackson has been pointing out for a number of years, our demographics are changing. The people who traditionally have gone into science and technology careers are becoming a small percentage of the population and workforce. If we as a nation are going to produce enough scientists and engineers to meet the demand, we have to increasingly turn to non-traditional groups – women and ethnic minorities. Second, a diverse workforce is a more innovative workforce. And innovation is the name of the game. Innovation drives America’s dominance in science and technology and in making the U.S. economy the largest and most dynamic in the world for the last century. A recen t book by Scott Page, “The Difference – How the power of diversity creates better groups, firms, schools, and societies,” describes how in group achievement diversity often trumps ability. Page ran all kinds of problem-solving simulations using groups of subject experts (the “best and brightest") and compared them to groups of random members. The diverse groups almost always beat out the “smart” groups, who often got stuck at the same place. The former could draw on a more diverse cognitive tool kit which allowed them to get past the obstacles that stopped the experts dead in their tracks. Page concludes that, “"Progress depends as much on our collective differences as it does on our individual IQ scores." With America in a national “slow motion crisis” as described by every leading business and educational organization, it is critical that we find ways to revitalize our science, technology, and innovation culture. One aspect of that is getting more women and minorities in the STEM (science, technology, engineering, math) pipeline early in their lives and keeping them there. Unless we diversify more than we are now, our businesses, institutions, and economic well-being are at risk. All week in San Antonio I've been hearing from geology professors stories about their graduate students getting job offers of $100,000 or more to work in the petroleum industry. Every where I went in the meeting, there was evidence of the frantic bidding wars to grab hold of professional talent. A lot of the exhibitors in the convention center posted signs saying they are hiring. A fair number of my colleagues have taken new jobs in recent months, presumably finding better postings, better opportunities, better locations, and I suspect, bigger salaries, bonuses, and over-rides. Geologists with Blackberries in hand would announce the price of oil ("$117!" "$119!") to whoever was in listening range. I had lunch with a professor colleague and a recently graduated student who took a job with a large independent in Oklahoma. She described the campus-like setting of their new building, the company teams (rowing, bowling, etc) that she joined, and it started sounding like the Silicon Valley start-up environments. Some profs are describing huge influxes of grad students into geology, but most are not. They are not seeing the undergrad populations rising either. But given the barrage of news stories around the country, I imagine the word is starting to sink in. 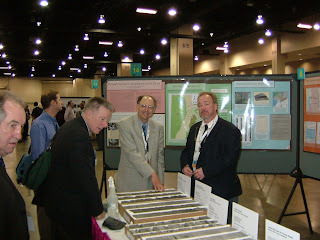 The anecdotal stories we are all bringing back from the AAPG meeting will help spread the word about this latest boom. A few of my seasoned colleagues who went through at least one of the industry downturns of the past few decades are offering cautionary notes to their alma maters. But with offers of $80-100K, how many are worrying about that? One of the pioneers in this field is GeoMechanics International (GMI), which has just been bought by oil field giant Baker Hughes. 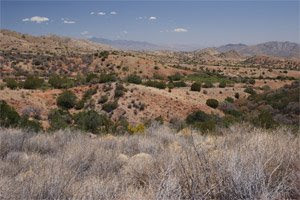 GMI has been consulting with Resolution Copper on their deep underground mine being developed near Superior, Arizona. AZGS had to develop standards and protocols for high precision mapping and characterization of earth fissures because such systematic detailed mapping has not been done before anywhere. 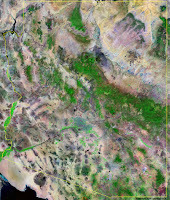 One of the challenges is documenting the uncertainties inherent in mapping and displaying geologic hazards that are in some areas actively growing in the matter of days or even hours, that may have little or no surface expression, or that have been covered over by earlier agriculture or development. Natural gas from shales is the hot exploration play across the U.S. The Bakken Shale in the Dakotas and Barnett Shale in Texas have been developed for a number of years, but the Marcellus Shale in the Appalachian basin and others are generating huge interest in industry. The USGS's new reserves assessment for the Bakken got everyone's attention. Given the Paleozoic and Mesozoic shales in Utah, we have to wonder if the shales in the northern Arizona portion of the Colorado Plateau may offer similar potential and attraction to the petroleum industry. Okay folks, this is an exclusive here at Arizona Geology. Tom Legg, the inventor of PaleoClock is unveiling his amazing clock right here! 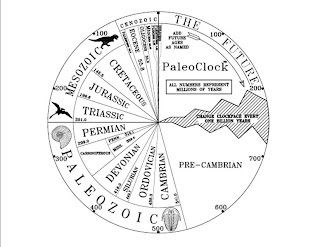 The PaleoClock clock is a running, functioning geologic clock that makes one revolution every one billion years. 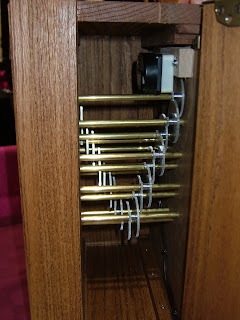 The inside of the clock contains a large train of 34 gears that reduces the speed of the clock down to the geologic timescale. Tom says this is the slowest mechanical device ever created. 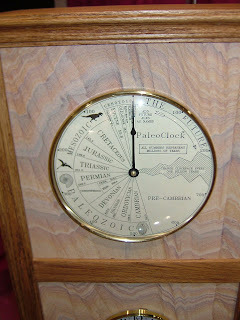 · The clock hand moves 1.616 picometers per day (a picomete r is one trillionth of a meter) and 5.9 angstroms or 590 pico-meters per year. · It takes 42,542,000 years for the clock hand to move one inch. · It takes the clock hand 32.79 days to move the diameter of a hydrogen atom (53 picometers). Tom unveiled the clock publicly tonight at the opening session of the AAPG annual meeting in San Antonio. Each PaleoClock is handcrafted by Tom of wood and unique minerals. The lower clock is a regular clock that tells regular time. Tom and I worked together in the oil biz back 25 years ago and has been showing me prototypes of the PaleoClock over the past months. One of the biggest challenges was finding just the right gears to make it wo rk. In the end, Tom had them custom made. Tom Legg can be reached at 713-444-6178 or tom@paleoclock.com. Update 4-22: I've added a photo of the gears that run PaleoClock, and a closer shot of the face. NOAA data shows March had the warmest global land temperature since it they began recording it in 1880. The ocean global temperature was the 13th warmest on record. Combined, it meant March was the 2nd warmest month for the entire planet. 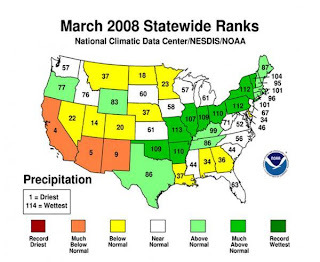 Combined with that, the Southwest had one of the driest months ever recorded. Faculty and students at the ASU School of Earth and Space Exploration have been pulling in national and international awards lately. 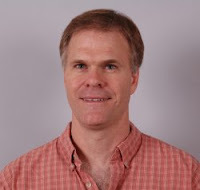 The Geological Society of America has chosen Philip R. Christensen, director of ASU's Mars Space Flight Facility on the Tempe campus, to receive its G.K. Gilbert Award. He will be formally presented with the award at the Society's annual meeting in October 2008. Melissa Bunte, a second year graduate student working toward her Master of Science degree in Geological Science in the School of Earth and Space Exploration, was recently honored for her presentation at the Lunar and Planetary Science Conference (LPSC). Her presentation, "Geologic Mapping of the Zal Region of Io," was selected for Honorable Mention in the poster presentations for the 2008 Stephen E. Dwornik Planetary Geoscience Student Paper Awards. 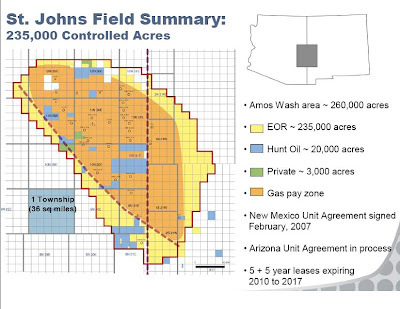 Ridgeway Arizona Oil Corp. has big plans to produce 350 million cubic feet (MMcfpd) of carbon dioxide daily from the St. John's area of east central Arizona and pipe it to the Permian basin of New Mexico and Texas to use it for enhanced oil recovery. Ridgeway is the operating arm of Enhanced Oil Resources of Houston. The Commission on Friday approved permits for Ridgeway to drill 3 horizontal wells in the St. John's field. These are the first horizontal wells ever drilled in Arizona. Ridgeway has 11 wells this year in various stages of drilling, testing, or completion and plans 6 more. After that, Portman says they will focus more on analyzing the results. Their goal is to document "proved undeveloped reserves" of 2 trillion cubic feet (Tcf) of CO2, which is what they say it will take to justify building a pipeline to move the CO2 to the Permian basin. That would supply the pipeline for 15 years. An earlier report indicated the St John's field contains 15 Tcf of CO2 in place, although only a portion of that is expected to be producible. Last week at the Science Generation conference, CNN science editor Miles O'Brien enthused to us about a slide/video presentation called "Shift Happens" (the actual title is "Did You Know" but it looks like everyone refers to the final message in the presentation) and used a few slides to provoke discussion from the early morning panel he moderated. I finally got a chance to view the entire presentation and it is provocative and startling. It started out as a powerpoint show for teachers in Littleton, Colorado, but has morphed into a video on YouTube and other online sources, with animations and music that has been viewed millions of times. There's a lot more there about the U.S. in the global framework. 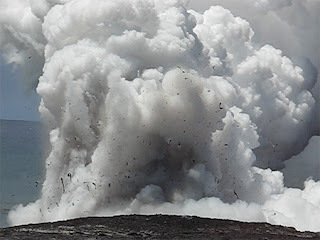 Fellow geo-bloggers Chris Town and Ron Schott offer the first episode of a geology podcast ("podClast") at the goodSchist.com blog site, covering "the latest eruptions on Kilauea, the pros and cons of peer-reviewed blogging and the current status of geology jobs." This is the future of expanding science communications. It's also available on iTunes. Dave Palais holds a PhD in geology from Arizona State University and is making news as he explores for spring water to bottle for Nestle. 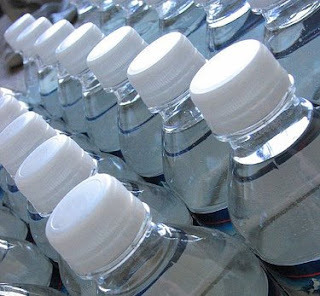 The April 14 edition of Business Week features Dr. Palais in its story on "Nestle's Water Wars." The plan to bottle the glacier-fed spring water in the small former logging town of McCloud, California, has torn the town apart. AGI has released a new analysis of the price increase in crude oil in the U.S. They show that the fall in the dollar is cause for part of the rise in oil prices. The graph here shows we pay about $50 per barrel more than if we paid in euros. AGI says, "If the US dollar had remained strong in the global economy, oil might, in theory, be around $65 per barrel. The impact of increased oil prices can not be ignored in the US economy, and, in turn, can further weaken the dollar." 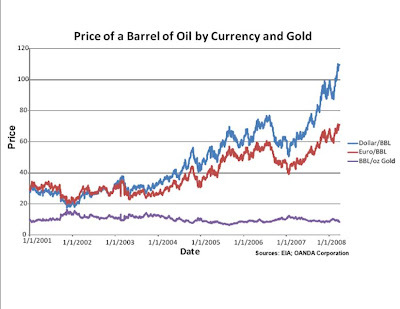 The comparison of oil cost to an ounce of gold shows how commodity prices run parallel. It's located on the ground floor of the Phelps-Dodge Tower at Washington & 1st St. We hope to open for business in a couple of weeks with a formal grand opening later this spring. Joe Hart, the Arizona State Mine Inspector, wants to transfer $1.2 million per year from the Arizona Arts Trust Fund to pay for cleaning up abandoned mines. According to a story in the Arizona Republic, Joe said, "It's not the role of the government to provide money for the arts." The arts community is not happy with the proposal, put forth as a bill by State Senator Robert Burns. Joe had earlier proposed filling old mine shafts with used tires but ran into environmental concerns and the plan did not get through the Senate. 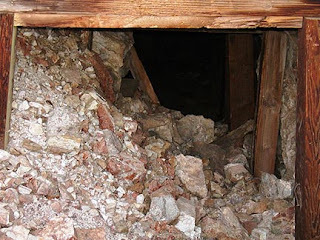 A new proposal is to allow donations of inert construction materials such as concrete or glass, that could be dumped into old mines to fill them. Action is pending in the legislature on that idea. Tucson's public tv station KUAT-channel 6 has posted a video report from Arizona Illustrated on the Rosemont copper mine debate, along with links to the mining company and its opponent. There's an accompanying short video of the proposed mine site. Additional public hearings have been announced by the US Forest Service for April 22 through June 30. Meanwhile, a report out yesterday says the La Nina is causing the worst drought in a century in Chile, leading the government to consider cutting electricity to the nation's mines. According to the report, 45-70% of electricity for the mines in central and southern Chile comes from hydroelectric power. 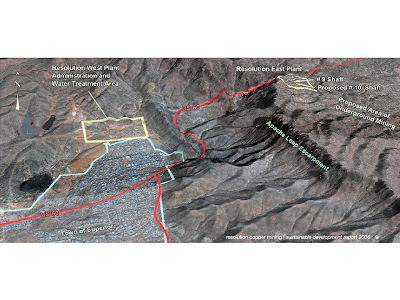 Phoenix-based Freeport-McMoRan Copper and Gold is one of the mining companies in the region. Chile is the world's largest exporter of copper. Copper futures closed the week at $3.94 per pound after going over $4 earlier in the week. 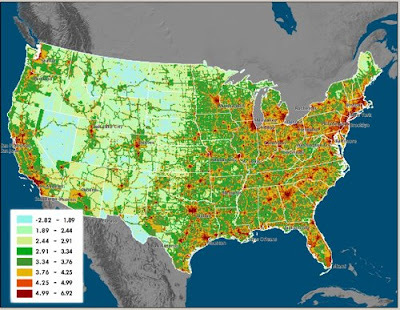 Carbon dioxide emissions for the Phoenix-Tucson corridor look as large as those for other major urban areas across the U.S. The NASA-DOE funded Vulcan Project at Purdue University calculated CO2 from industry, power generation, ground transportation, commercial, and residential sources for 2002. The units are log base 10 of metric tonnes of carbon/gridcell/year. The data are plotted for 10x10 km grids.